I was doing one of Sasha Graham's wonderful Tarot Spells where you enter a card and see things from his/her perspective. 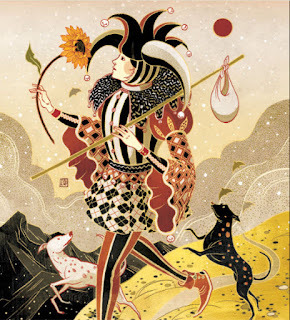 This particular spell had me entering the Fool and as I entered the card, I found myself feeling hopeful and full of faith and as I took that fateful step off of the cliff, I found solid ground. Looking straight ahead, I saw a wonderful shimmery bridge that was only visible from the perspective of the person taking the leap of faith. As I took my first step on that shimmery bridge that I knew was leading to my future, I heard the fool whisper in my hear "Take the step and the bridge will appear." Interestingly enough that's the title of a book that I bought several years ago and had forgotten about until I received my message from the fool. It's moved from the bottom of my bookshelf to my nightstand and as I've started to read though it, I've realized why the book was at the bottom of my bookshelf. When I bought the book, my impression from thumbing through it was that if you took the first step, the entire path would be laid out before you and you would have an absolute guarantee that things would work out. I've never found that to be the case in life so I got frustrated when I first picked up the book and put it back down. However, I've gained maturity since I first bought that book and had my own experience with taking the next right step and being guided to the next one. My guides knocked that message into my head heard when I got lost on Bell Tower could not find the path. I had to ask for directions and the message was find the first cairn and once you've found that one, you'll be able to see the next one. All I had to do was keep finding the next cairn and I'd find my way out. I'm realizing that my guides are giving me two messages via the Fool. The first is that I need to take the next right step in building a spiritual business that can sustain me in retirement. I don't need to have the entire plan laid out right now, all I need to do is to take the next right step and the path to the next cairn will appear. The second is a little harder for me as I need to not only trust my guides that the path will appear, but I also have to trust myself to take the right steps. For someone who has struggled with self esteem issues and struggled to believe I'm worthy of being led and that my efforts and knowledge are worth sharing, that is a tremendous act of trust and faith. However, the message they are whispering in my ear is that I am a child of the Goddess and of course I am worthy.